Tools, clothes, weapons and even human body parts… 3D printing has become the 21st century’s new manufacturing technology. As expected, this somewhat futuristic world has also made its way to professional kitchens. Eating is no longer an act of fulfilling a basic need to nourish oneself. It has become a ritual. TV shows like Masterchef, The Great British Bake Off and Chef’s Table have joined the infinite universe of cookbooks, gurus and YouTube channels. Millions of people are interested in this art form in which chefs have been raised to the pedestal of leading lights, of experts. Flavour is important, but in a world dominated by appearances, #foodporn, and colourful Instagram accounts, pictures of pale mashed potatoes with four scattered meatballs no longer do the trick. 3D printers have managed to concoct fake caviar, edible cartoon characters for kids made out of spinach, and menus written with edible letters so sophisticated you don’t know whether to stab them with a fork or frame them to be displayed in your living room. The world of 3D printing has made its way to kitchens. Forever? “Hang on, let me plug the cable in.” Mateo welcomes me virtually in the dining room of his house in Lérida, his hometown. Just two months ago he became a father, so he is laying low. His face lights up when he tells me about his journey. “It’s great, you got lucky getting in touch with me now that I have more time. This job is incredible, but it also means I have to make sacrifices,” he tells me through the computer screen. “For me, this 3D stuff sounded alien. But one day I thought: if I don’t know much about it, there must be plenty other people who have never even heard of it and who might be interested,” he explains. 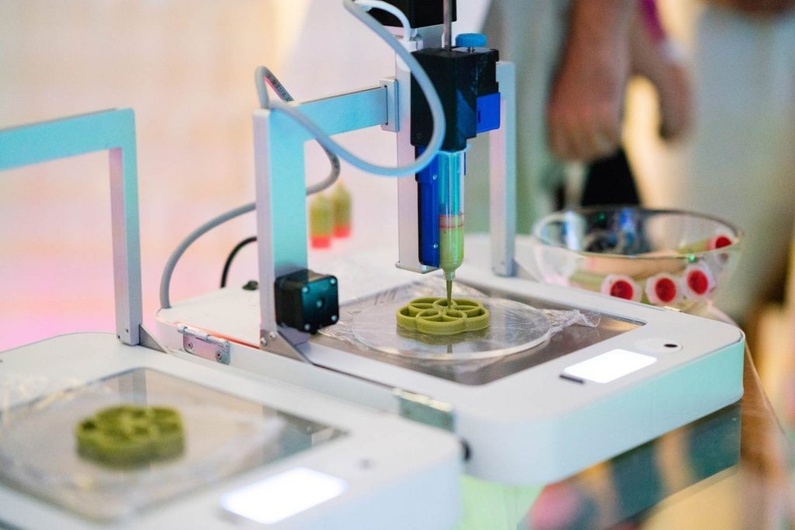 3D printing was already being used in Europe for industrial manufacturing for 15 years before it began to appear in the Dutch and Spanish food industries. The Netherlands and Spain are home to two of the most important companies that initiated food printing: ByFlow and Natural Machines. “After presenting printed food at the convention in Madrid, we went to Maastricht to ByFlow’s 3D printing factory to learn more about this innovative technology.” The process evolved and Mateo became a kind of guru that everyone called up. Mid discovery boom, Marcio Barradas and Antony Dobrzensky joined forces to kick-start an international project called FoodInk. Their biggest milestone was opening the world’s first restaurant in London where everything, from the chairs and tables to the food, was printed on location. The event, open to the press, took place over the span of three days and the guests (12 per day) enjoyed nine dishes created by Mateo. The price? 250 pounds per person. “I find it really sad that only a very select few can come to that kind of event, but the idea was to invite personalities and companies that we could collaborate with in the future and eventually make this art form accessible to everyone,” Marcio explains. “We are trying to democratise it, but first we need investment.” The team plan on taking the project around the world, but the dates and locations are yet to be confirmed. 3D printed food often plays with aesthetic perfection. But for some chefs and designers, like Dutch Chloe Rutzerveld, printed food should also have a purpose. During a TedX conference, the designer explained that technology, in addition to impressing people, should also solve problems in the food sector. Otherwise, it runs the risk of becoming a snobbish technology, a reputation that chefs like Pepe Rodriguez and Sergi Arola have highlighted in the past. Starting at 3,000 euros, the price of the printers themselves isn’t exorbitant for professionals or home chefs. In fact, the price is comparable to the Foodini machine from the Spanish Natural Machines. But costs of designers and technicians who configure the software do add up. 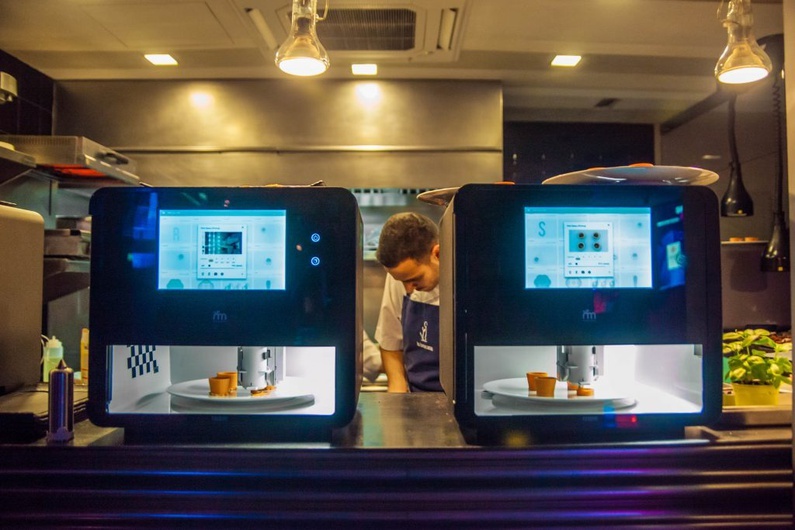 Some companies, such as Basquecook, have launched inventions like Oskook – a domestic kitchen robot capable of cooking using modules from open source software – into the market. From proposition to product, just like that. Still, the food printing technique also has its downsides. “Is it the fastest way of getting food?” asks Lynette Kucsma, chief of marketing at Natural Machine, in a promotional video. “No, the fastest way to eat is to buy processed food, open the package and microwave it. But that isn’t very healthy.” 3D printing doesn’t save time for the consumer, but it does allow you to control what you eat, which experts believe will be beneficial to people with allergies and other dietary issues. But what’s the point in cooking a filet and then blending it? “The idea is to change the way food is presented, not to change the flavour. You can make a dessert that will last forever, without preservatives or chemicals, like the famous Portuguese pasteis de belem, but present them in different designs. It really is a 21st century form of artistic expression,” Mateo explains from the other side of the screen. Will machines replace chefs? “You must not forget that it’s still the cooks who ensure that the dish is tasty. The machine builds the dish, but the chef determines whether the ingredients are sustainable, fresh and of good quality.” Although there are no regulations regarding 3D food printing, chefs continue to ensure that there are hygiene standards and quality in the products.